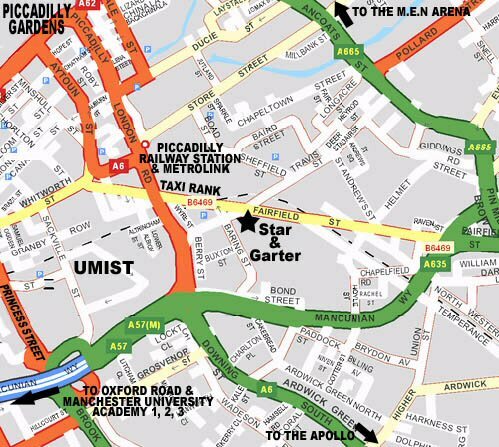 The Star & Garter is location on the B6469 (Fairfield Street) approximately 200 yards from the Taxi Rank / Drop Off Point / Short Stay Car Park at the rear of Manchester Piccadilly Railway Station. Follow directions to Piccadilly Train Station and then follow signs for Sportcity or Ashton. Follow the Mancunian Way into Manchester and head East (towards signs for Sportcity) until you reach the first set of traffic lights at the end of the Mancunian Way. Turn left at these lights and you are on Fairfield Street. The Star & Garter is stood on the corner approximately 500 yards ahead at the next set of lights. Make your way onto the A665 Great Ancoats Street and follow signs for the A57(M) Ring Road. Once you pass the two sets of traffic lights at the retail park (Argos/Curry's/Toys 'r Us) turn right after the next set of lights down Adair Street. Follow this road until you reach a bridge. The Star & Garter is on the immediate left when you pass under this bridge. Make your way onto Oxford Road and head into the City. Turn right at The Cornerhouse/Palace Theatre/Oxford Road Train Station onto Whitworth Street and follow this road straight up in the direction of Manchester Piccadilly Train Station. Once you have reached the station drive past the entrance to the drop off point/taxi rank. The Star & Garter is on the corner at the next set of traffic lights. Buses 219, 220, 221 run along Fairfield Street and past the Star & Garter. Alternatively there is the free city centre bus which runs all day long to Manchester Piccadilly Station. Take the Tram to Manchester Piccadilly Station (the journey's end) and follow the signs for Fairfield Street the moment you step off the tram. Leave via this exit and turn left when you reach Fairfield Street. The Star & Garter is right in front of you at the traffic lights. Make your way to the Fairfield Street Exit by following signs for the Taxi Rank and walk straight up Fairfield Street. The Star & Garter is stood approximately 200 yards from the taxi rank at the traffic lights. View The Star & Garter in a larger map.